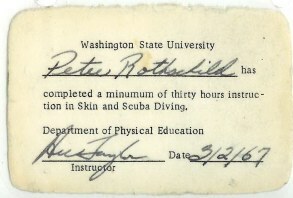 I convinced my father to learn to dive (not that it took all that much convincing!) and the two of us dove in Puget Sound and Maui on and off for years. 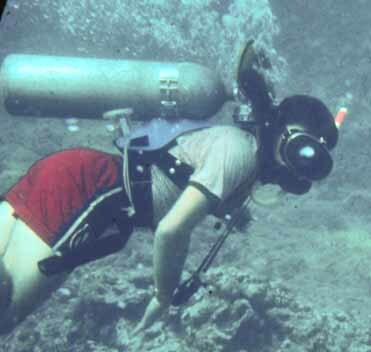 Here you see a picture of a MUCH younger Peter diving in Maui in the late 60's, using a "Mae West horsecollar" flotation device (this was before Buoyancy Compensators (BCDs) were developed), AquaMaster 2 Hose Regulator (just like the ones in Sea Hunt) and carrying a Nikonos 35 mm underwater camera. While the fun of diving hasn't changed, the gear has! As I got older, got married and had children, my diving tapered off considerably until starting up again with a vengeance in 2005 when my wife, Lynne, and I started diving together. Since restarting my diving career, I have several hundred dives in Puget Sound, several hundred dives in various tropical locations and many dives in the Caves of Mexico's Yucatan and the Florida Panhandle.